Our new PARADIGM electric and acoustic strings – the most advanced guitar strings known to man – are available now for pre-order. PARADIGM strings feature superior break-resistance and unparalleled durability while delivering iconic Slinky tone. In fact, we’re so confident that PARADIGM strings won’t break or rust, that we’ll replace them absolutely free if they do within 90 days of purchase. Some of the hardest playing guitarists on the planet have attempted to break them. Paul Gilbert, Tom DeLonge, Dustin Kensrue, The White Buffalo, John Petrucci and Kenny Wayne Shepherd all stepped up to the challenge, and all failed to break them. Virtuoso shredder Paul Gilbert of Racer X and Mr. Big knows how to put the hurt on a set of strings; he’s even got an album titled I Can Destroy. One thing he can’t destroy, even with the help of his guitar-pick-equipped power drill: PARADIGM. 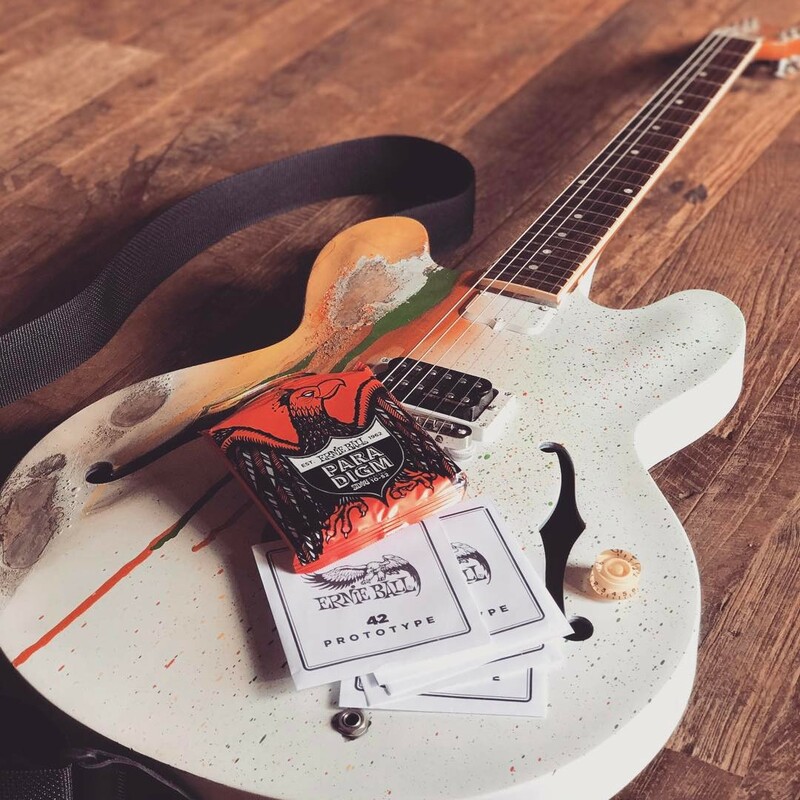 The Angels & Airwaves / Blink-182 / Box Car Racer guitarist took a set of PARADIGM Skinny Top Heavy Bottom strings for a spin with his classic Blink-era amp rig, but was unable to defeat our new strings. Thrice’s frontman put a serious hurting on his PARADIGM strings right here at our headquarters. Despite the punishing heaviness of his playing, the strings survived completely intact. Jake Smith, AKA The White Buffalo, is known for putting his acoustic strings through the ultimate torture test every time he plays. He went in even harder on a set of PARADIGM, but still couldn’t break them. Dream Theater guitarist John Petrucci has achieved a particularly high status among guitar aficionados for his sheer strength. He took a run at a set of PARADIGM strings, and ended up detaching his tremolo arm before he could even put a dent in them. Bluesman KWS took a set of PARADIGM strings for a test drive. Although he rode them hard, in the end he wasn’t able overcome their strength. That said, hearing him try sure sounds great. Take a 3D look inside the exclusive plasma enhancement process that PARADIGM string wrap wire undergoes, which removes defects and greatly improves corrosion resistance. Not sure about the “song” by Tom DeLonge but enjoyed the slo-mo. Just “little bit” more would be nice to see his or anyone’s technique. Interest in trying the strings. Have more using them on acoustic please. Thanks for the ads. Pretty cool. I’m 62 and playing 4 years acoustic.